A couple whose French bulldog was struggling to breathe on a Jetblue flight last week has credited a pair of flight attendants with saving the dog’s life. Steven and Michelle Burt were traveling from Orlando to Worcester, Massachusetts, on July 5 with their 3-year-old French bulldog, Darcy, when they noticed the dog was in distress. They took Darcy out of the pet carrier under the seat in front of them and saw that his gums and tongue were turning blue, a sign that he wasn’t getting enough oxygen, according to a Facebook post. A pair flight attendants, Renaud Spencer and Diane Asher, came to the dog’s aid with a small oxygen mask, which Michelle detailed in a grateful letter to JetBlue that was posted on Facebook by a friend. 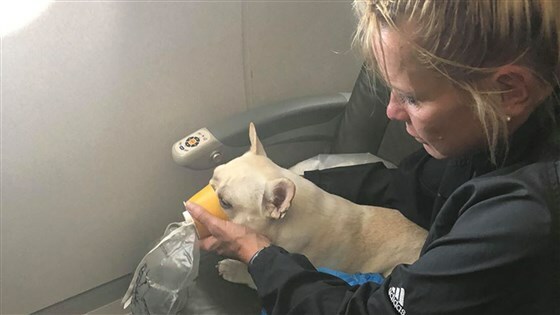 “We all are affected by cabin pressure and oxygen fluctuations, human, canine and feline, etc., but the fact that the Attendants were responsive and attentive to the situation may have saved Darcy’s life,” Michelle wrote. The flight attendants also brought ice bags and water for the dog. Spencer is also the owner of a French bulldog, according to Michelle, and he brought a small oxygen tank and mask to help Darcy’s breathing. The actions of the flight attendants helped avoid a tragic situation like the French bulldog puppy that died on a United flight in March. A flight attendant forced the owners to place the pet carrier containing the dog into an overhead bin during the flight, and the owners found the dog dead after the flight landed.